The ocean is at your feet at this wonderful 19th floor Penthouse at Prince Resort II. Bask in the warm sun on the pool deck or on your own private balcony with breathtaking ocean and main-land views. Enjoy the Ocean Drive Difference by starting your vacation immediately upon arrival, as this property comes with fresh bed linens/bath towels, the beds are already made up for you, and the departure maid service are all included in your price Try the on-site restaurant for added convenience, and keep up with workouts in the on-site fitness facilities. This condo features 2 bedrooms and 2 bathrooms as well as a full kitchen for easy meal prep. The master has a king bed, balcony access, ocean views and large private bath, while the guest bedroom has 2 full beds for your guests. A full size washer and dryer are yours to use, and WiFi internet access is also included. 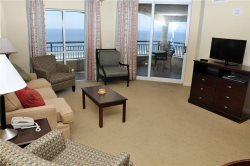 Rent this amazing condo for your next vacation and see why Prince is the premier North Myrtle Beach resort! Book your trip to the Prince Resort today! Extra bonuses include free parking, unlimited use of amenities and on-site restaurants, convenient location, and all the savings of our own Endless Fun Club!